A cold grey morning to start with, but we were away by 8:00. In Vines Park there are several swing bridges across the canal. The locking mechanisms could do with a bit of maintenance as they can be very difficult to open. One of them is across the “Barge Lock”. 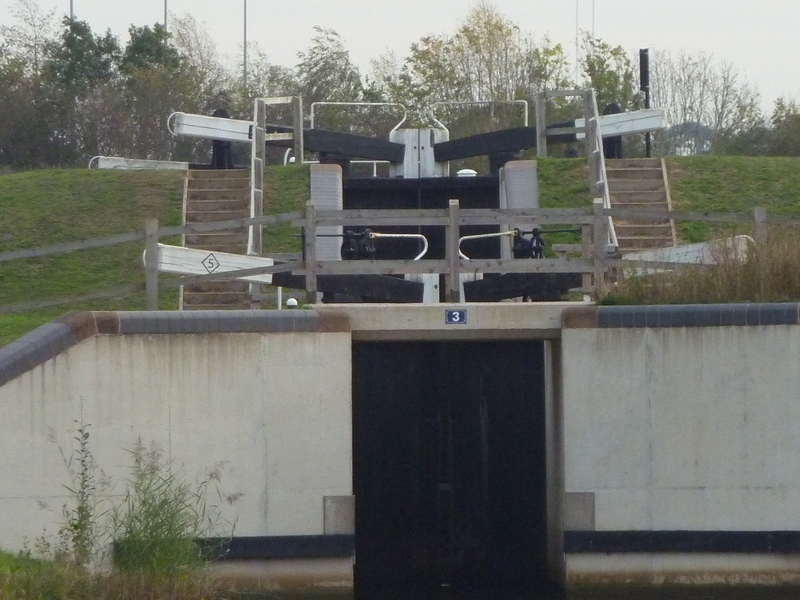 This is a flood lock as the navigation drops down onto the River Salwarpe for a short section. The river was not in flood so we opened the gates at both ends and went straight through. The next lock takes you back up onto the canal again. At this lock BW workmen were installing three bollards as per all the other narrow locks around the system. The guys were really peed off about it as they knew that they were unnecessary and a possible danger. So didnt BW learn anything from all the negative publicity arising from the installation of these bollards awhile back ? Soon we came to the tunnel under the M5. This was built as a culvert for the River Salwarpe and was never intended to be navigable. 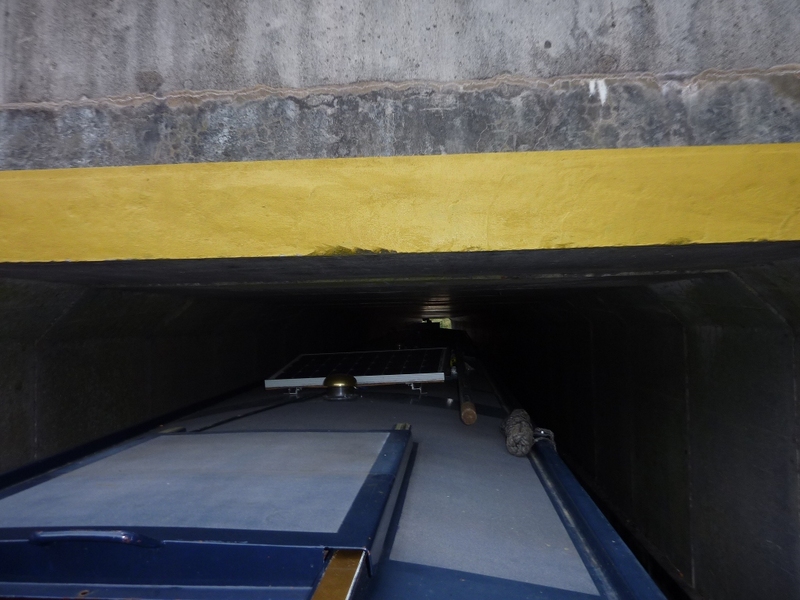 The headroom is very tight and the amount available depends on the level of the water in the Salwarpe. Soon after the M5 tunnel we came to the staircase pair no 4 & 5. It looked as though the last boat down didnt know how to operate a staircase correctly. The bottom chamber was empty, and so was the top. But it was completely empty, no water at all. It looked as though they had left the middle paddles up when they emptied the bottom chamber. So we brought the boat in, then I lifted the middle paddles and the top paddles to fill the two chambers simultaneously. When the bottom chamber was full I dropped the top paddles, let the boat into the top chamber, closed the middle gates & paddles. Then opened the top paddles again. All this took quite a while, but the sun was trying to shine and it was warming up so I didn’t mind. The weather was getting gradually colder as we cruised on towards Worcester. The pounds in the Gregory’s Mill area were very low on water, with one oncoming boat telling us that they had been aground for over an hour. 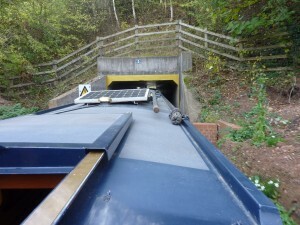 We moored up on the approach to Diglis basin, near the services block. A meal at Cafe Rouge tonight with Tesco tokens !